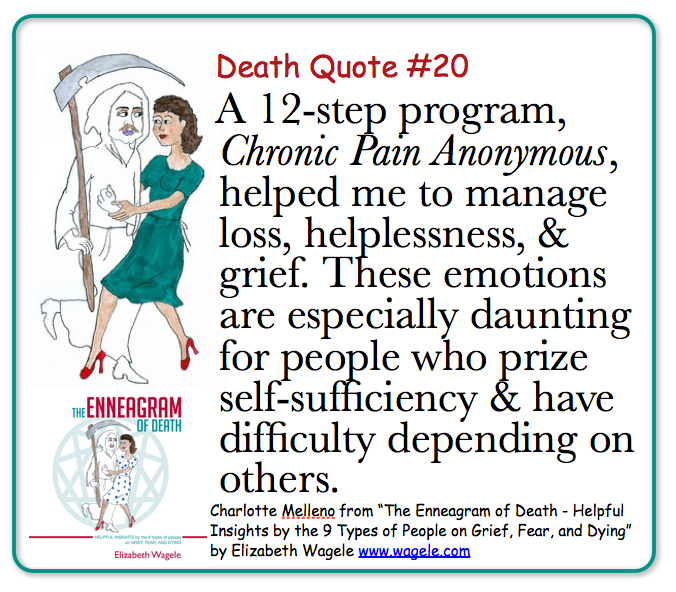 This story about an Enneagram 5-Observer type from The Enneagram of Death – Helpful Insights by the 9 Types of People on Grief, Fear, and Dying, is infused by the feelings and style if its Enneagram 4-Romantic author. I watched him approach the car door, his grimace expressing the awful effort of each step. He looked like both a baby and a very old man, his face almost skeletal, his skull completely bald. This man once reveled in his muscles, his forearms strong and furred with blond hair, the blue veins roping them like a package. More than once he’d said, I am short but I carry myself like a big man. Frank was the most alive and vital man I’d ever known. Now he sat in the passenger seat and lifted his right leg into the car with both hands. Then he leaned out and pulled the door closed. A week later, carrying a shopping bag with the ingredients for dinner in one hand and holding the banister in the other, I climbed the two steep flights to Frank’s apartment with difficulty. When he answered the door, Frank ‘s hug was more affectionate than usual—a two-armed embrace rather than the one-armed casual lean-in. He hobbled through his narrow hall, its walls covered with religious art and artifacts—a crown of thorns, paintings of Mary holding the infant Jesus and the Sacred Heart of Christ. After he reached his kitchen chair, I began taking dinner out of the bag—comfort food from New York, where I grew up—fixin’s for a Reuben sandwich and knishes imported from Coney Island -and looked around for cooking utensils. He began to stand, to try and help, but I recognized the grimace around his mouth and forehead. He was in bad pain. My usual dose of morphine was doing its job of blunting my own and I could manage without him. “Sit, just sit. It’s okay. You don’t have to do anything,” I said, looking into his eyes. I felt stunned and allowed myself a moment to take it in. “I have lived to hear those words,” I laughed. He did, too. Bending hurts my trunk and makes the nerves in my ribs and abs fire like an AK47 ripping through the center of my body. I remembered how, two months ago at Christmas, he had rolled his eyes when I asked him to fetch a platter for me from a low shelf. I had flared, “I pray to God you never have to know the strength it takes to live with a chronic illness.” Now, I understood that my prayer was half a curse, which both failed and succeeded. I don’t remember what he said next, but it was strange enough that I asked him to stop and repeat it. A few days later, his doctor diagnosed his cancer at stage 4 and told him it had metastasized to the bone and was inoperable. He gave him three to six months to live. An Air-force brat, and later, Captain in Viet Nam, Frank’s first tendency in any crisis was to make lists centered on details and delegation. He focused on issues like whether he’d stay in his apartment and, if so, how, during daily radiation treatments, he’d manage the stairs. An experienced manager, he immediately created several support networks to deal with issues of daily living, i.e., grocery shopping, cooking and housekeeping. Beside myself, two people were his closest support system; our son, Daniel, and Frank’s lover, Don. Visit Elizabeth’s updated web site to check out her books, CD, articles on Beethoven and introverts, her cartoons and videos, and her Famous Types page. 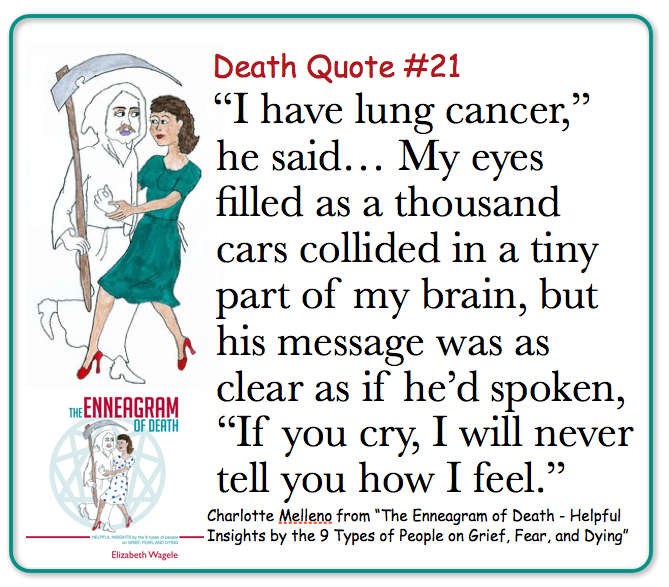 See the new review of THE ENNEAGRAM OF DEATH in the recent Enneagram Monthy by Courtney Behm! Read about Petreus’ and Broadwells’ types, Problems with our prisons, Genes and Achiever types, the Helper type and more in Elizabeth’s recent blogs on Psychology Today. Great Information, thanks for the great Article.